In today’s fast-paced world, the family dinner can easily get swallowed up by work, errands, and kids’ activities. But sitting down to a healthy home-cooked meal doesn’t have to be a thing of the past. 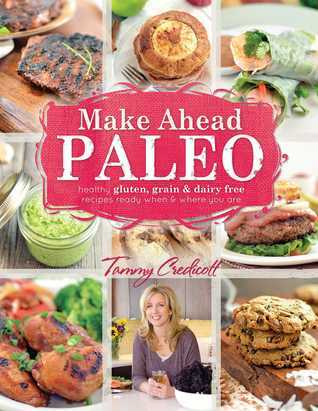 In Make Ahead Paleo, Tammy Credicott shows you how to eat well at home and on the run, without sacrificing flavor or good nutrition. Tammy offers up more than 100 flavorful recipes that are ready when you are, wherever you are, each one beautifully illustrated with a photo that will inspire you to start shopping and chopping: dishes such as Garlic Topped Flank Steak Roulade, Apricot Orange Pork Chops, Mushroom Meatballs, Apple Cider Chicken Thighs, Paleo English Muffins, Chocolate Chip Tahini Blondies with Toasted Coconut, and even Pumpkin Cardamom Pancakes. You’ll be amazed at how easily, economically, and efficiently you can feed your family grain- and gluten-free meals using fresh, natural, whole-food ingredients. Make Ahead Paleo is the perfect guide for cooks who don’t have all day to slave over a hot stove but still want their meals to taste as if they did. Wherever your hectic life takes you, make it nutritious, make it flavorful, and make it ahead! I love bread and pasta and would eat spaghetti with sauce for lunch and dinner every day of the week if I could. But I know I need more veggies and protein, which is why I’ve been picking up paleo cookbooks and recipes lately- with their emphasis on meats and vegetables, on real food, it fills in the gaps for me and lets me not feel guilty about eating that huge plate of pasta with marinara at my favorite Italian restaurant. The photos are gorgeous and full-color. They make me want to eat the food. It really is make ahead. There are sections for prepare and freeze, slow-cooker, even easy one pot meals that they suggest using for travel, but work nicely for me for busy weeknights. The treats. The other day having one of the granola bars I had made from this book saved me from eating way too many of those mini-cupcakes somebody brought to work. The recipes are not complicated and for the most part have ingredients I can find at my local grocery store. One thing I wish was different: I would like some side dish suggestions. Cocoa Spice-Rubbed Ribeyes look delicious but what do I serve them with, beside a salad? I’ve tried a few recipes so far. The homemade not-free granola bars were delicious and easy, but this instagram photo doesn’t do them justice. My husband liked them too. The Oregon pork was a hit at our house too, with its mushroom red wine sauce. We weren’t thrilled with the Citrus Red Onion Slaw with Grilled Chicken, but it might be partly because the onion I had was really oniony. The dressing was yummy though. I’ll leave you with the recipe for those granola bars, mostly because I’m thinking about making another batch today or tomorrow. I know it’s a long list of ingredients but some I just always have around. Line an 8” x 8” square pan with parchment paper, and grease it with coconut oil. In a small saucepan over low heat, combine the coconut oil, maple syrup, coconut nectar, sunbutter, and vanilla extract. Stir occasionally just until the ingredients have melted and mixed. Set the mixture aside to cool, about 15 minutes. In a medium-sized bowl, combine the pumpkin seeds, sunflower seeds (both roasted and raw), sesame seeds, chocolate chips, raising, and coconut flakes. Pour this coating mixture over the bar mixture in the saucepan. Stir to combine all ingredients. Spoon the bar mixture into the prepared 8” x 8” pan. Place a sheet of wax paper over the top and press down firmly with you hands to compress and even out the top of the bars. Remove the was paper. Bake the bars for 30-35 minutes until bubbly and golden. Remove from the oven and let cool for 1 hour. Cut into bars. Let cool completely. Place the bars in an airtight container and refrigerate them to fully firm them up. I can always use more slow cooker recipes and am just starting to use my freezer more… think I need to take a closer look at this cookbook! How do you make pumpkin pancakes, and what looks like cookies on the cover image, without grains/gluten? I’m assuming there’s no flour. Curious. Those are apple ring pancakes, which do look delicious. She uses coconut flour and almond flour in them, same with a lot of the cookies. I like that it’s truly make ahead! Loving the sound of those nut free granola bars, I’ll be sure to pass the recipe on and mention the book. I just picked up my first Paleo cookbook but need this one too because I need things I can make ahead! Thanks for the recommendation. This looks good. Always enjoy trying other people’s paleo recipe books.